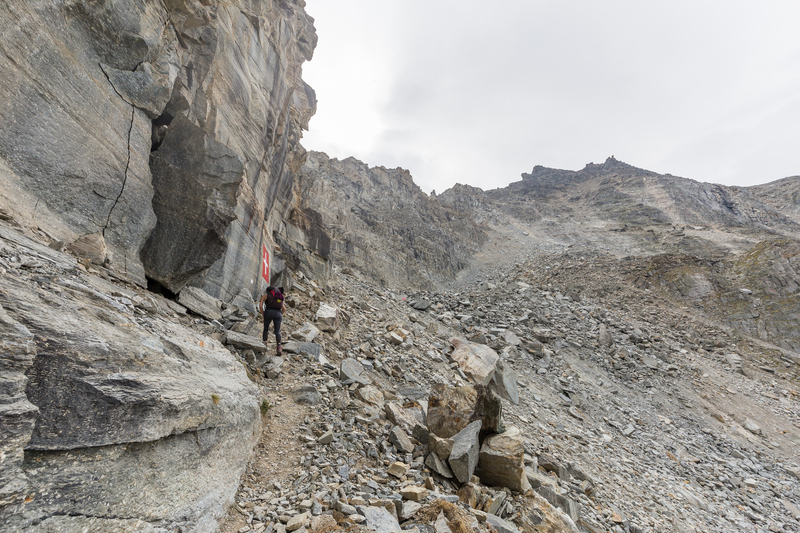 Three years ago, two friends and I wanted to hike up the Platthorn (not to be confused with the Platthorn southeast of Gasenried), a 3345 m muffin rising upwards northwest from Zermatt. We were thwarted by snow then, and despite rather pleasant conditions we deemed it best to descend the mountain the same way we came up, namely on foot and not on tush — or worse. We had probably ascended to 3000 m elevation, but we left the summit unreached despite the Platthorn not being an “R-word“. This trip, I met up with a work “colleaguin” from Abstatt, and on our first full day in Zermatt the weather held out beautifully. We tackled the Platthorn on our first day, summiting mid-afternoon. We enjoyed the peak to ourselves, and with stomachs grumbling, descended back down toward our refuge for the night, Berggasthaus Trift. The hut was closed for the season the last time we went; this time, it was packed to capacity. It took just one bite of the spaghetti bolognese to remind me how much I like pasta. Three bowls of the stuff and a pleasant chat with our German tablemates later, we retired to bed early, comfortably exhausted from the 1700 m elevation gain and the long drive in the day before. The next day, we departed the hut after breakfast, heading uphill toward Höhbalmen before meandering downhill toward the Zmutt stream and then ascending again up to Schwarzsee. It was a beautiful Sunday morning, and we met no oncoming hikers all the way up to Höhbalmen. Schwarzsee, served by a cable car, was naturally much busier, but incoming storm clouds pressed us along. Continuing downhill to Zermatt, we did a quick clothing change before taking the train up to St. Niklaus and a bus from there to Grächen, our second overnight. For those saying that Swiss trains run like clockwork, we got to experience the fun of a stopped watch when the train sat unable to move on the tracks for about forty-five minutes. Several restarts later, we were on our way again, which garnered cheers from the entire train car: most passengers were in town for the folk festival that weekend, and some were returning to Montreux, another three hours or so distant. One of the highlights of the trip and the reason for leaving Zermatt was to be the Europaweg, or “Europe trail” in its much less elegant English translation. Its trails parallel the Matter valley and lead into Zermatt 600 m above the village, and in clear weather it is supposed to be one of the most beautiful hikes in Switzerland. In the middle of high season, it’s difficult to find availability in the Swiss huts even a few weeks out, so instead of beginning our trip in the north and entering Zermatt with the trail, we initially entered Zermatt with the train, left with the train, and re-entered via the trail on a Monday-Tuesday, when the hut had still had open beds. Grächen is a common starting point, which when walked in a southerly direction requires a relentless 800 m climb out of Gasenried. I was curious how my legs would hold up on a third straight day of 1000 m or more gain, but to my relief they managed pretty well. 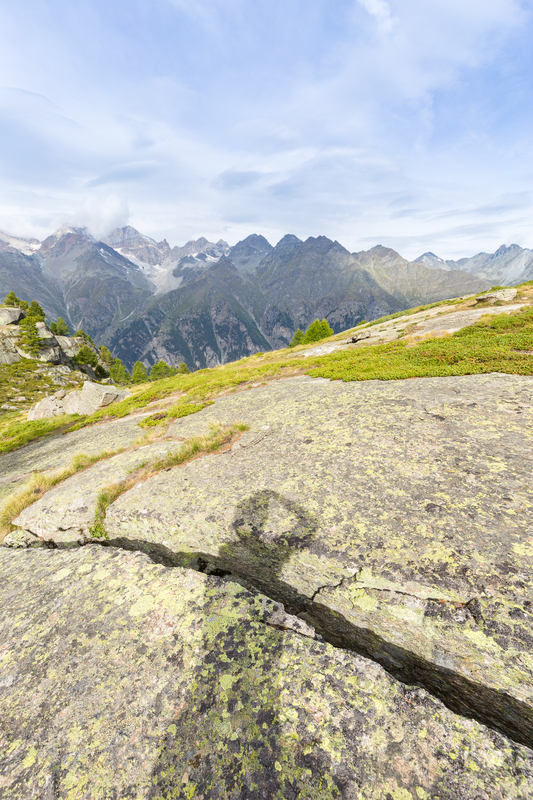 About 1:50 after we set out from Grächen (a full hour shorter than most route maps budgeted for the ascent), I reached the top of Grathorn, happy that there was sunlight and some wind to dry my perspiration while my camera greeted my shadow. So far, we had lucked out on weather. 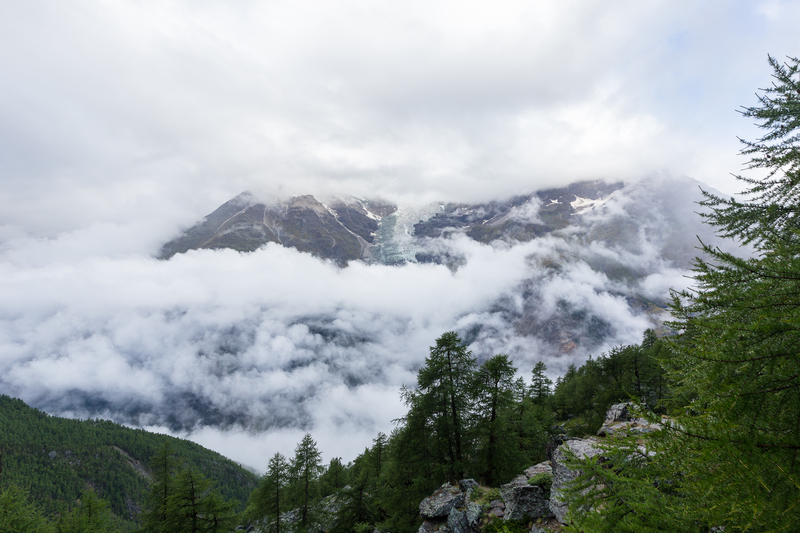 The first two days were brilliantly clear; the storm that chased us away from the Schwarzsee never passed over Zermatt. 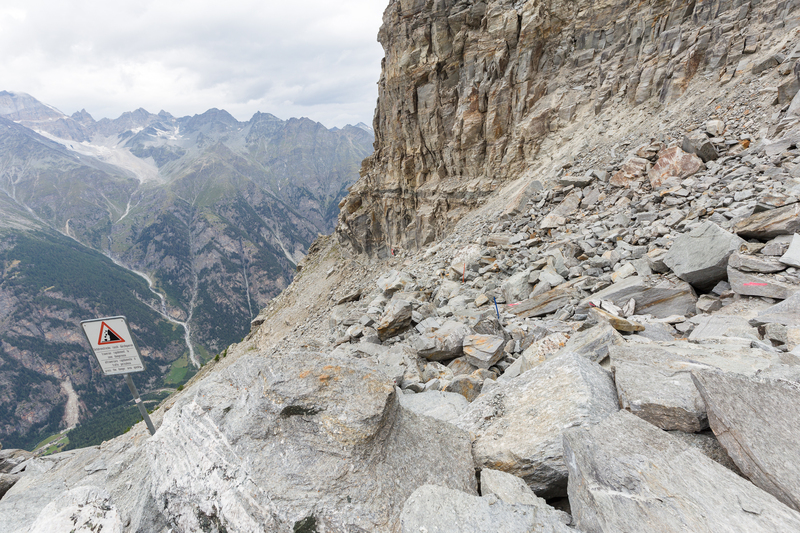 We continued our climb up the Europaweg, now high above the Mattertal and reminded quite often of our precarious position. 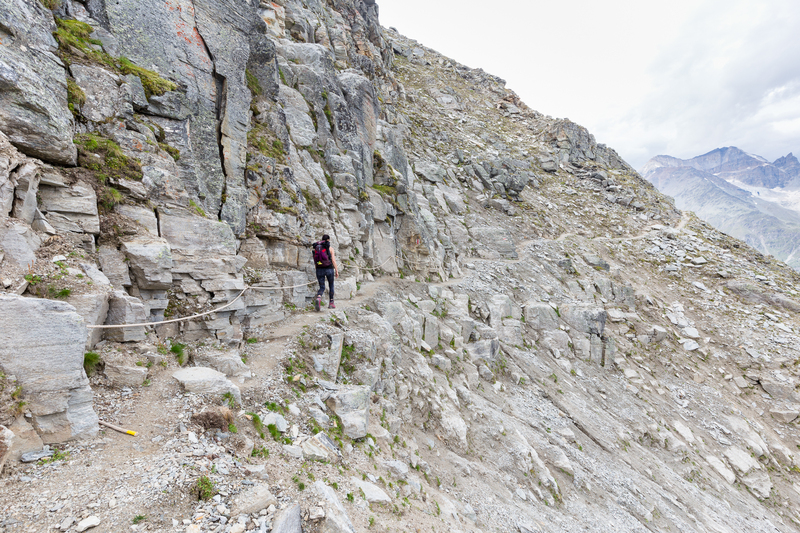 The trail here is unlike much of the typical hiking in the area, as the rock is crumbly and visibly battered by the elements. Sometimes the way was obvious and straightfoward, random rope sections occasionally appearing and disappearing but not necessarily offering much confidence against a tumble down. Other times, finding the way forward was left to our own navigation. It was in this area that other hikers have complained about rocks singing overhead, and in a few spots we spotted trail markers of former years meters below us, suggesting rockfall continually obliterated old trails and formed new ones without regard for whether any lifeforms were on the trail when they occurred. Eventually, we reached the highest point on the Europaweg, the rainclouds to the south now starting to darken as we began the gradual descent. So far, the trail hadn’t been too busy; we passed an Australian and his friend from Michigan and two German-speakers, who also took time to sprawl out on the rocks of Grathorn. 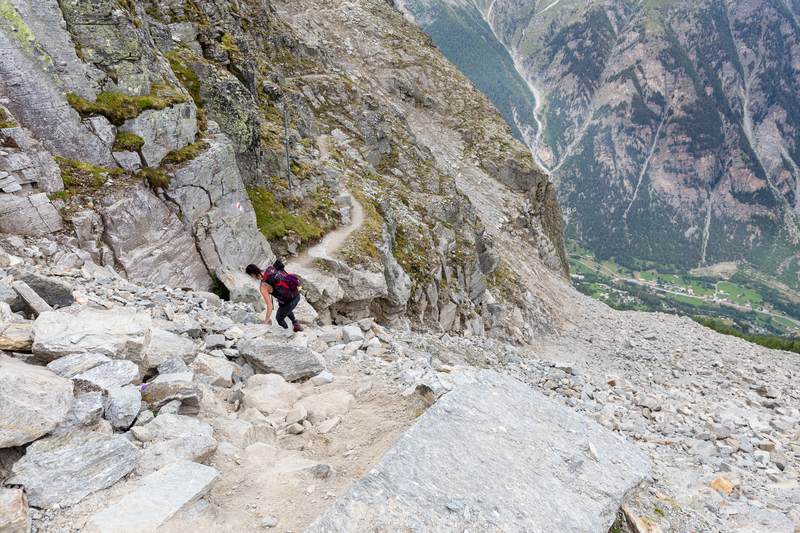 As we continued toward our stopping point for the night, we came across the first of the hikers coming up from Zermatt. We exchanged observations of what we had each traversed and continued on our ways. The rain began to fall, appearing to take our descent as a cue that they, too, needed to come down. It wasn’t a hard rain and there was no wind, so we managed to stay mostly dry. 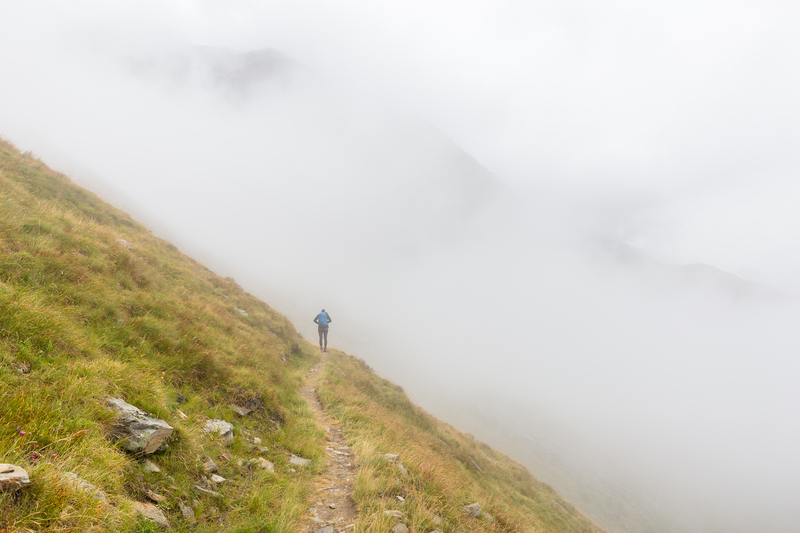 Thankfully, the most outrageous sections of the trail were behind us now, and we enjoyed the quiet fog as we trekked onward, now unable to see the valley floor below. Every so often, the fog would lift just enough to remind us where we were and what surrounded us. It was kind of soothing, almost meditative: I go so often into the mountains to be reminded of how boundless nature is, and here among the white softness I was provided constant, fleeting reminders of that very expanse. 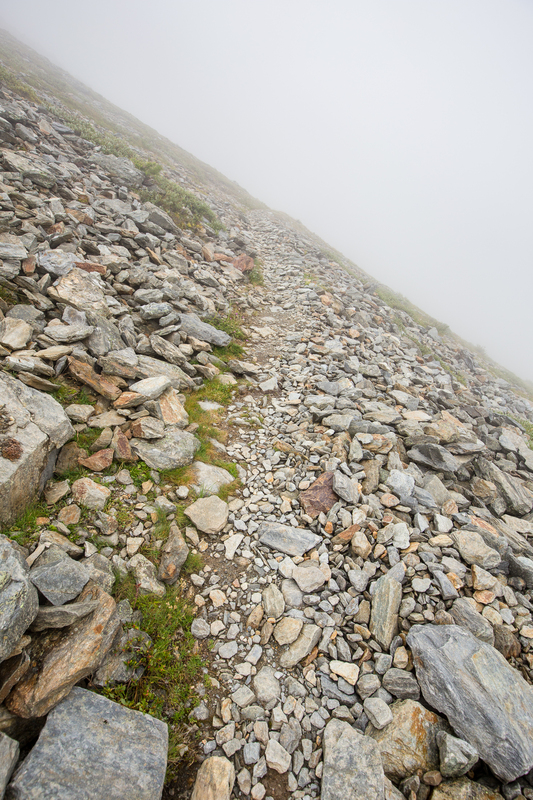 The trail was no longer physically demanding at this point, and the stress of constant mental awareness required in the rock fields had also begun to ebb. At least now there was a clear trail, even if its destination was typically obscured. The rain had stopped, leaving a stillness that was sharply interrupted but somehow not disturbed by the crunch of stone beneath our feet. 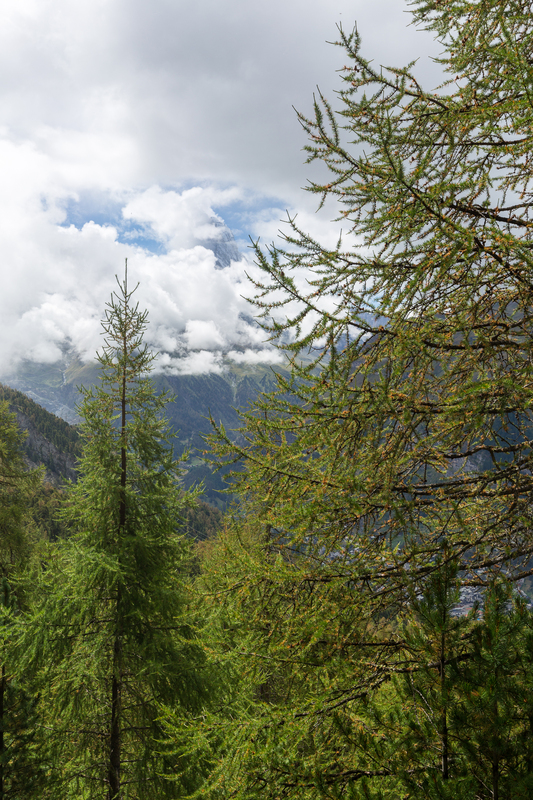 Around three hours after we felt the first raindrops, we came across the clearing in which sits the Europahütte, the midpoint of the entire trail. 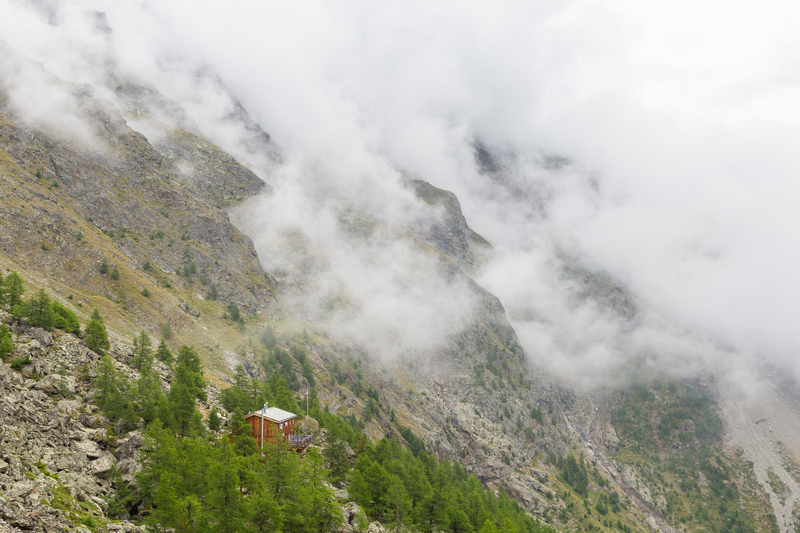 We had passed an American couple on the path, and at the hut we saw we were actually the first ones from had hiked from Grächen. We sat around the hut’s dining tables, chatting with two friends from Belgium who had come up from Randa exclusively to see a suspension bridge, and later, the American couple we passed earlier. 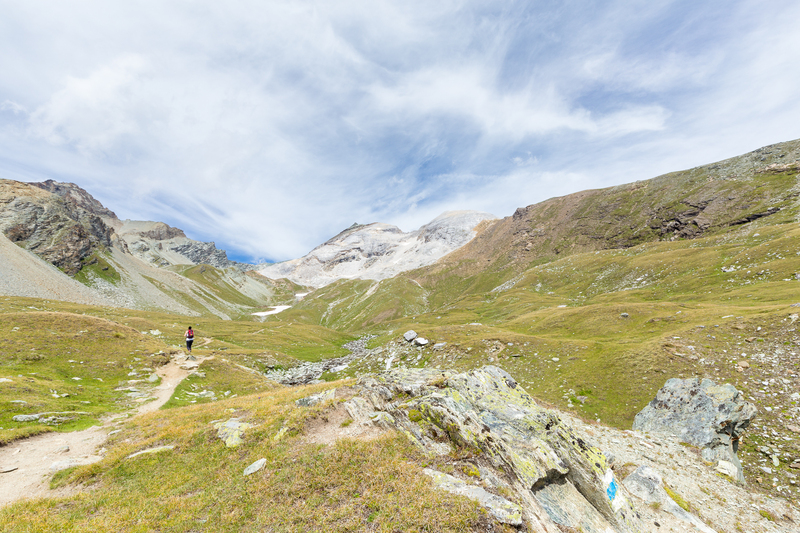 It turns out the couple had planned to hike from Chamonix to Zermatt but changed their minds after the husband’s knees started bothering him. This hike, perhaps best known as a Haute Route for skiers, has been on my list ever since I knew I’d be coming to Europe, but with weather always uncertain and not willing to attempt it alone I put it out of my planning. It turns out the two-day Europaweg is the recommended conclusion to the route, which seemed somehow appropriate, though at the time I couldn’t put my finger on why. As daylight crept away, so tauntingly did the clouds. 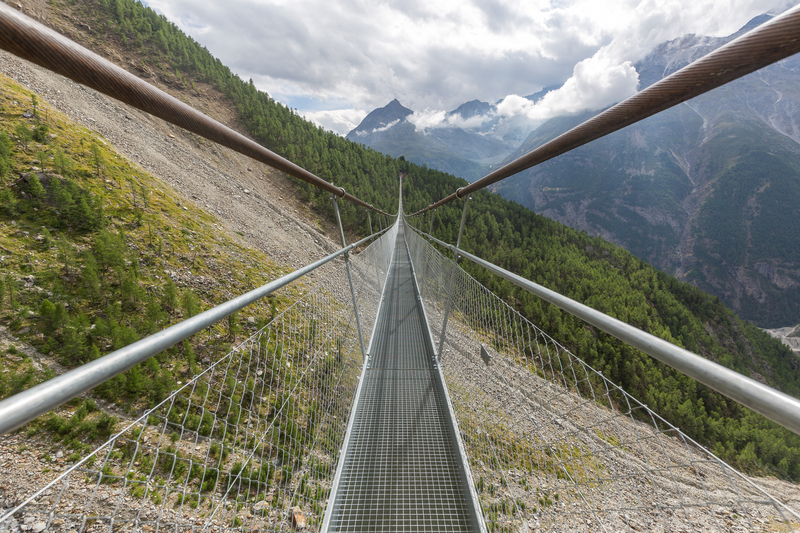 The Europahütte is only about a 15 minute walk to the world’s longest pedestrian suspension bridge, the Charles Kuonen, the same one the Belgians we had met in the hut came to see. With my psyche rejuvenated and energy replenished after the anxiety around the first stage of the hike subsided to elation that even with the rain, slippery wet rocks, and prickly exposure it hadn’t been so bad, I decided to add on another 200 m of elevation gain to the day to scope out the bridge before our official crossing the following day. To get to the Europahütte we had to cross a much smaller bridge earlier, and though the Charles Kuonen bridge was much stiffer, its grated floor also unnerved me considerably more than the first bridge did. I wandered out to the halfway point, snapped some shots on the bridge, and headed back to the hut, my stomach once again starting to growl. Dinner here was not quite as cozy as it was at Trift two nights ago, but this hut also generously offered seconds, which I happily took before another early night. It seems the secret to going to bed early is ironically to be in the most beautiful places in the world; it’s in places that have no spiritual effect on me that I seemingly search hardest for them. 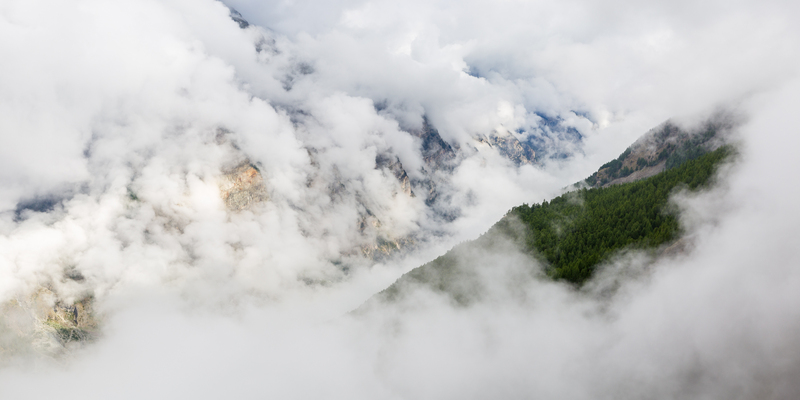 Overnight, the clouds did not depart and we indeed got more rain, leaving the morning briskly cool, with the crisp bite of fresh mountain air that signals the beginning of autumn and water droplets dangling from the pine needles. We politely plundered breakfast, filled up on fresh Swiss water, and packed up and headed out, bidding farewell to the other groups we met — a trio from Australia and New Zealand, a Singaporean, a Swiss-Canadian couple, the American duo, and our German (a different group this time) tablemates. 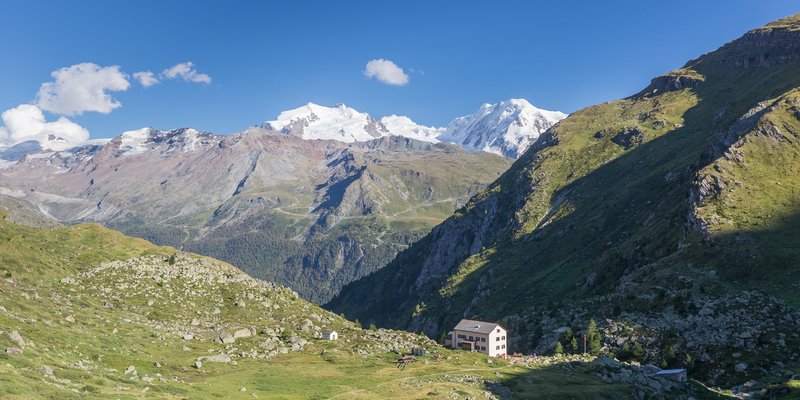 It occurred to me that these mountain huts in Europe could go by another name: they’re essentially hostels with a wait staff and staffed kitchen! From Randa, the next major town toward Zermatt is Täsch, and though we couldn’t see the valley all the time, we could hear the fairly regular whistles of the now-running (presumably) trains as they arrived and departed the station there. 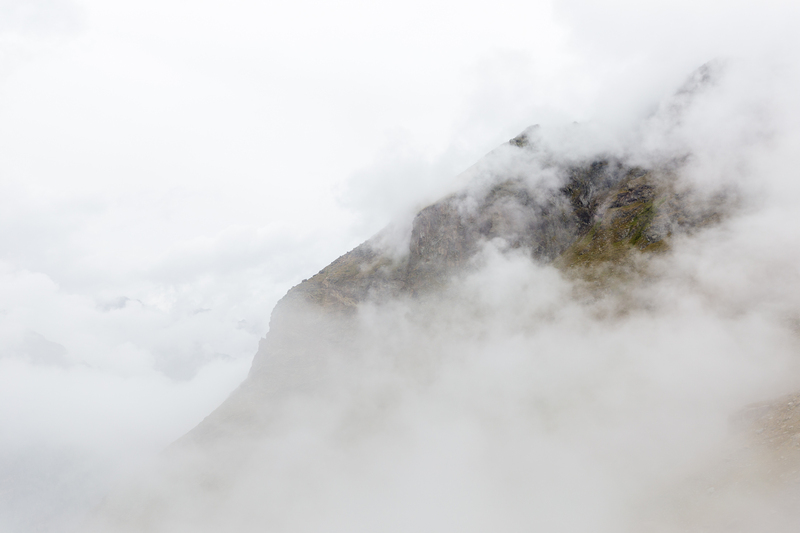 It was superb light — the clouds would clump and thin, a warm glow occasionally illuminating the stillness around us. It was difficult to set a consistent pace with all my starting and stopping. As the sun climbed overhead, the shadows shortened and the lighting became more harsh. By this point on a clear day, the Matterhorn would have stood out prominently as the sentinel at the end of the Mattertal, but we never caught a glimpse of it on our entire hike. Lower in the valley, we came across a clearing, the clouds parting for just long enough to reveal the village of Zermatt beneath. 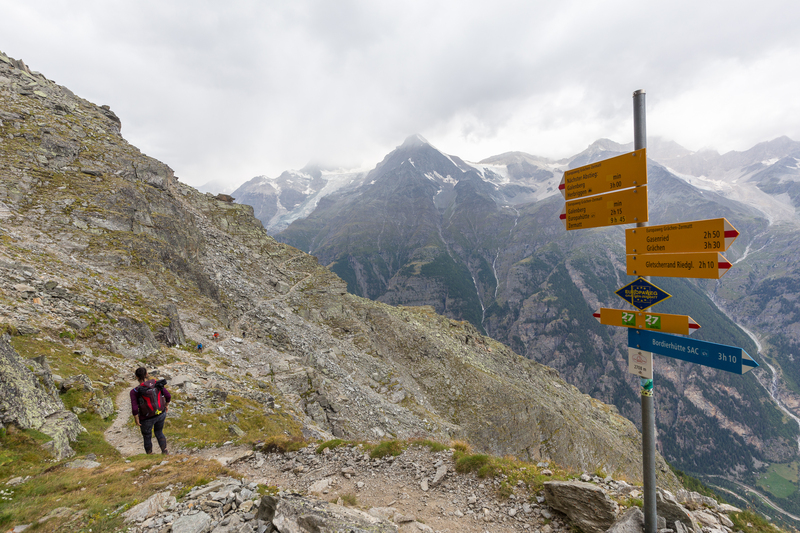 The second day of the Europaweg and our last hiking day of the trip was much flatter than the first three days, and fittingly the clouds never much lifted to culminate into a grand finale with endless views of the Matterhorn. 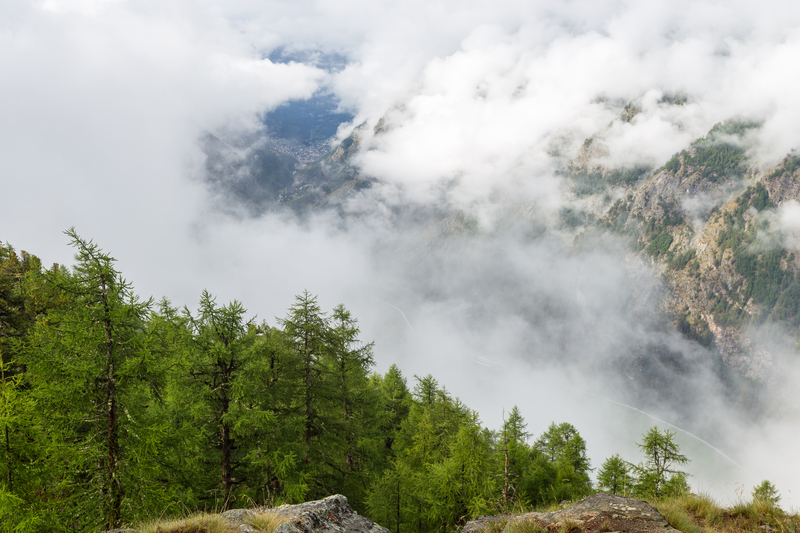 This might then be the first post ever about hiking among the Zermatt mountains without a single picture of the Matterhorn, which might at first glance seem sacrilegious. Then again, going to Zermatt — this my eleventh trip there — was never about a mountain; it was never about these mountains. I’d argue it was never about gaining elevation for the sake of gaining elevation, and not truly about the allure of finding the best spot or conditions for a stunning picture, chase one relentlessly as I may. The tap water here is the freshest I’ve ever had, and my favorite restaurant in Europe is here, but even combined this isn’t the biggest draw, either. The people in Zermatt are blessed with a dose of patience and friendliness whose source I can hypothesize but not explain, but admittedly, I’m not naturally drawn to tourist towns, even if their stores are open on Sundays. Instead, there is something about being in the shadows of high mountains that evokes transcendence and redemption, a reaction that engenders tranquility while infusing an enormous dose of humility, of hope. It’s spiritual, healing, and at its core, addicting. Perhaps the true beauty of the Europaweg is therefore not visual but far more figurative, concealed in its protracted approach to Zermatt: over the course of approaching Zermatt one footfall at a time I gradually realized that likely no number of repeated trips here would be able to prepare me for needing to say goodbye to this sanctuary. The Matterhorn is in this sense a symbol of that serenity, and maybe it was best this way, not to have the mountain in my face the whole time, as it might have been an overwhelming reminder that this trip might just have been my last farewell to a place that I can only describe to others, and sometimes to myself, as home.